Why choose Aaron’s Restoration for your Saint Clair Shores MI water damage restoration needs? We will cover your deductible! We spend time with you and make sure you understand what’s happening every step of the way. When you have water damage Saint Clair Shores MI, count on Aaron’s Restoration for rapid response and damage repair. We are the Saint Clair Shores water damage restoration company you can trust to restore your home or commercial property to its original condition, quickly and affordably. Whether you have water damage or flood damage caused by a broken, frozen or leaky pipe, a malfunctioning water heater, refrigerator, washing machine or dishwasher, a toilet or sink overflow, or due to storms or flooding, we will come in immediately, make sure that water extraction and removal begins immediately, and then do any further water cleanup that is needed, including contents restoration and full water damage repair services. We handle the insurance for you and cover your deductible, and we do everything that we can to restore you to the same, if not better, condition that you were in before as quickly as possible. Aaron’s Restoration provides a full range of water damage related services, including sewage damage cleanup and removal, basement water damage and storm damage. Our focus is on maintaining the integrity of your Saint Clair Shores area home to minimize damage and begin the restoration process as rapidly as possible. No other Saint Clair Shores MI area restoration contractor offers such a well-integrated array of services. CALL 888-442-2766 FOR A FREE, NO OBLIGATION QUOTE! If the water source is evident and safely accessible, shut off the water main or close window or door from which water is getting into the property. 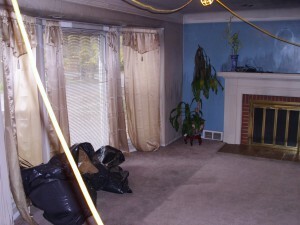 Remove all property valuables that can be damaged. Water damage repair to bring it back to the pre loss condition.